Centrally located in Old Quarter, Essence Hanoi stands out along Ta Hien with its white frontage, stylish signage and uniformed doorman, which all hint at the quality within. 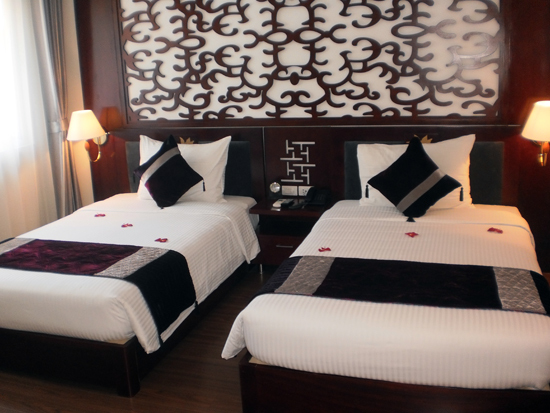 Essence is within easy reach of the delights of the 36 streets as well as Hoan Kiem lake and the French Quarter. It’s also easy to pick up a cyclo, hire a motorbike and find a taxi, so getting around from here is no problem. Useful when you’ve had an argument. Essence offers four basic room types: superior, deluxe, junior suite and the “Essence Suite”; it’s also possible to link two deluxe rooms to make a family room suitable for up to five people. The main differences between the rooms are the size and the windows: superior rooms have small windows which face a wall whereas deluxe rooms and suites get a lot of natural light, and the Essence Suite has a 10-metre balcony. Apart from that, rooms are similarly decorated and fitted out, with all having desks, safety deposit boxes, flat screen TVs, refrigerators, minibars, hairdryers, and tea- and coffee-making facilities. As a bonus, shiny new laptops are provided in every room and there’s free Wifi throughout. 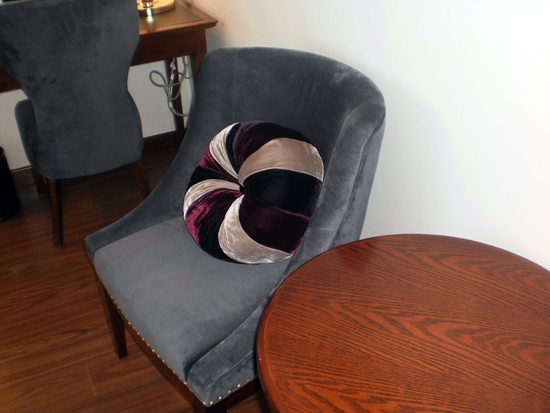 A fruit basket and bottled water are also supplied every day and included in the room cost. Design is clean and uncluttered, with white walls and bedding, dark wood, velvet throws and armchairs, and the essential rose petals on the bed. And importantly, beds are bouncy and pillows plentiful. Breakfast is included and served in the Essence Cafe on the ground floor, which also serves Western and Vietnamese food at lunch and dinner. There’s a small seating area by reception, with an array of international newspapers and some second-hand paperbacks, which is a pleasant place to relax with a book and a coffee for an hour or so. Given its central location, the superb staff, quality of the rooms and added extras such as welcome drinks and the fruit basket, Essence is reasonably priced, starting from a single priced at $45$50 during low/high season through to the Essence Suite going for $100/$110. Although superior rooms are excellent, if you can afford it it’s worth upgrading to at least the deluxe, as the natural light, street views and slightly larger bed are worth the extra US$10. And if you have the cash and want a bit of luxury, jump straight to the Essence Suite, which has a separate lounge area. Numerous alternative options are nearby, from the dorm rooms at May de Ville round the corner, to budget rooms at Camellia 6, to similarly priced options such as the new rooms at Classic Pho Hotel on Hang Be. Or head down to Hang Trong for slightly pricier boutique options such as one of our favourites, the Golden Lotus Hotel, or Maison d’Hanoi. Alternatively try one of its sister hotels: Essence Hanoi is the newest addition to the Hanoi Elegance Hotels Group, which runs five hotels in the Hoan Kiem district of Hanoi. Essence will suit couples looking for comfort, style and quality customer service, but with action on the doorstep – bia hoi corner is seconds away. It’s also a great choice if you’re visiting with family and want to keep them close but not too close, as the inter-connecting rooms provide space and privacy. However, Ta Hien is a particularly noisy street and once you leave the serenity of the hotel it’s straight into the mayhem of Old Quarter, so if you want to get away from it all, look elsewhere. 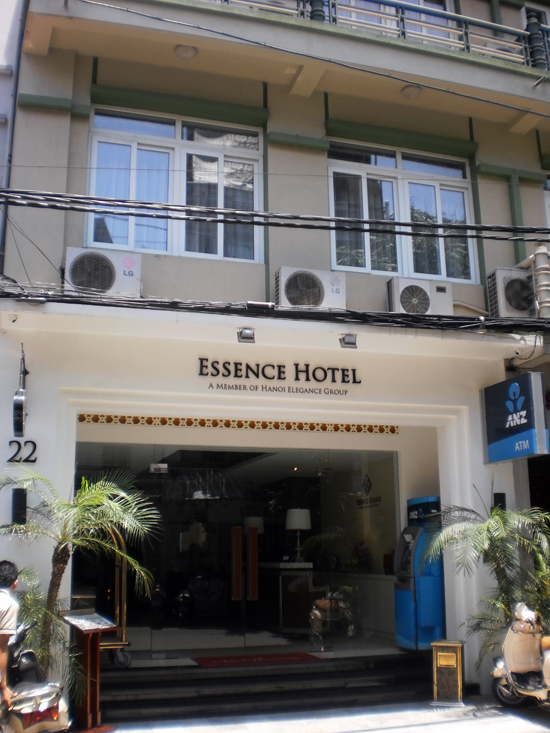 Overall Essence Hanoi is a welcome addition to Old Quarter and is definitely worth considering for the midrange traveller.